SUBSCRIPT: What do J.C., BBB and Jay Silverheels have in common? Answer tomorrow. Before J.C. Brizard rides off into the sunset, we have to pay one more tribute to the kinds of Hollywood productions in which he has recently co-starred, with a nod to one of his illustrious predecessors in this kind of narrative. Above, soon-to-be Chicago Mayor Rahm Emanel, in white hat and tights, looks on as future Chicago Schools Chief Executive Officer, Jean-Claude Brizard (in buckskins and headband) waterboards a suspected terrorist. The photos are from a rehearsal for "Rahm, the Next Chapter." The reality show is playing daily in Chicago, and continues being scripted by some of the best minds in fictional America. 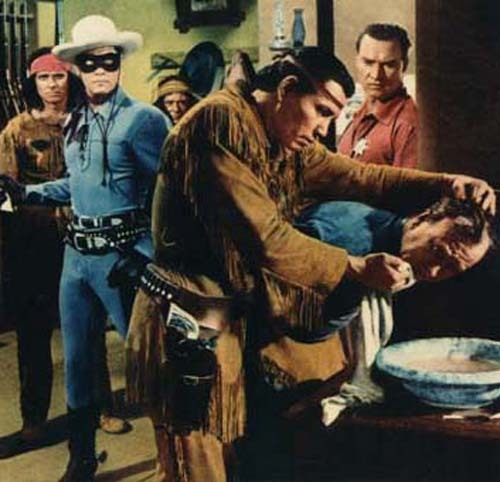 So as J.C. leaves us with a half million dollars or more for his pain and suffering the question has to be asked: What do Rahm, J.C. and Jay Silverheels have in common? Answer tomorrow. Bonus question. Will Barbara Byrd Bennett have to wear buckskin like her Hollywood predecessor when she begins doing the rounds with Rahm?